Solution of stochastic nonlinear identification problem is proposed. 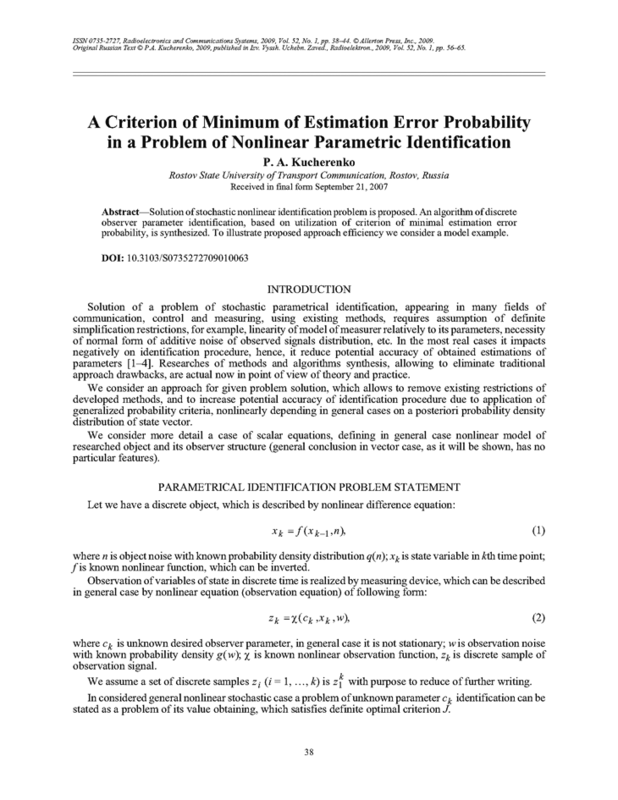 An algorithm of discrete observer parameter identification, based on utilization of criterion of minimal estimation error probability, is synthesized. To illustrate proposed approach efficiency we consider a model example. D. Grop, System Identification Methods (Mir, Moscow, 1979) [Russian translation]. B. N. Petrov, G. M. Ulanov, I. I. Gol’denblat, and S. V. Ul’yanov, Model Theory in Control Processes (Nauka, Moscow, 1978) [in Russian]. A. A. Krasovskii, Theory of Automated Control. Handbook (Nauka, Moscow, 1987) [in Russian]. Sh. E. Shteinberg, Identification in Control Systems (Energoatomizdat, Moscow, 1987) [in Russian]. V. I. Tikhonov and V. N. Kharisov, Statistical Analysis and Synthesis of Radio Engineering Devices and Systems (Radio i Svyaz’, Moscow, 1991) [in Russian]. B. R. Levin, Theoretical Principles of Statistical Radio Engineering (Radio i Svyaz’, Moscow, 1989) [in Russian]. B. Bunday, Basic Optimization Methods (Edward Arnold, London, 1984; Radio i Svyaz’, Moscow, 1988).